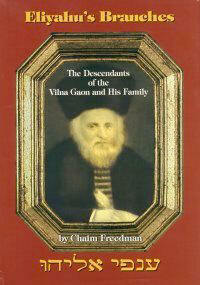 Several Bloch families claim descent from the Gaon of Vilna. Although these Bloch families were not aware of a close relationship between them, the common denominator between their independent traditions of ancestry is the claim of descent from the Gaon of Vilna. This tradition is so widespread that it would seem that there must be some basis to their claims, as it improbable that so many people of the same surname would unjustifiably claim to be descended from the Gaon. It is not clear whether all Blochs are related. The name is particularly prevalent in Lithuania, where the earliest persons bearing the name lived in the seventeenth century in Vilna and included the in-laws of the Gaon's cousin Eliyahu Pesseles. The name may have been registered for many unrelated families by an overzealous government clerk who was responsible for enforcing the surname law in the Russian Empire in 1804.
was the link with the Gaon. Bloch's wife, Rakhel, was a daughter of Rabbi Yehoshua Eliezer Rokeakh of Vidz, Lithuania. The source of this information was the late Rabbi Yosef Kahanaman Rosh Yeshiva Ponevezh in Bnei Brak, who told members of the family when he met them on several occasions that Yehoshua Eliezer Rokeakh was a descendant of the Vilna Gaon in the fifth or sixth generation. Rokeach lived in the town of Vidz, Lithuania, where Kahanaman had served as rabbi and was told directly of the relationship. Although no documentary evidence exists to trace the exact line of descent of the Rokeakh and Bloch families, it seems that the connection is well founded, as a scholar of Rabbi Kahanaman's reputation would not have repeated idle rumours. This author has researched many Bloch and Rokeakh families, but has failed to locate any record of Rabbi Yehoshua Eliezer Rokeakh of Vidz. There were few Rokeachs in Lithuania; the major branch of the family is Khassidic and was located in Belz, Galicia. One prominent Rokeakh family lived in Pinsk and was connected with the renowned Levin family of Pinsk. The Vilna Rokeach family shares its ancestry with the Galician branch, and spread from Vilna to Volkovysk and Bialystok.There were marital ties between several branches of the Rokeakh and Bloch families, but Yehoshua Eliezer Rokeakh has not been discovered amongst the descendants of such unions. King who located death and marriage certificates in England and Australia. It was known by the family that Phillips came from Poland/Lithuania to England about 1850 and settled in Australia in 1854. His original surname was Bloch, and he changed it in England to Phillips. The terms of the tombstone inscription bring the descent of Hyam Phillips much closer to the Gaon than would have been expected from the material researched by this author, particularly with respect to the time frame involved. The Gaon was born in 1720 and died in 1797, eighty years before Hyam Phillips died. Accepting the authenticity of the tombstone inscription establishes that an actual grandson of the Gaon of Vilna settled in far off colonial Australia, a unique and amazing discovery. In fact Hyam Phillips's departure from Lithiuania in 1850 and subsequent move from London to Australia in 1854 took place at about the same time as several of the Gaon's grandchildren and great-grandchildren left Europe. Tuviah Yurbarsky settled in Jerusalem about 1860, and Shmuel Yekhezkel Vilner settled in England about 1870. These emigrations are unique in that they preceeded the large waves of Eastern European Jewish emigration, which took place in the 1880's. 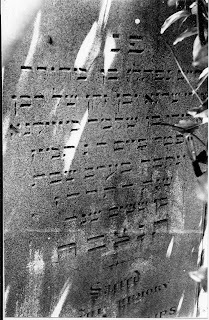 Given the name of Hyam Phillips's father as stated on the tombstone as "‏Rabbi Uri Shraga"‏ת Hyam Phillips' identity can be established precisely. Hyam's marriage certificate records his father's name as "‏Philip Phillips", but the death certificate records the father's name as "‏Hyam Block Phillips"‏. It can be assumed that neither record was exact, particularly since the father and son could not have had the same name. Ashkenazi Jewish naming custom forbids naming a son after a living father. It was a common custom for Jews in English speaking countries to use the name Phillip for the Hebrew Shraga. Knowing from the tombstone in Australia that Hyam Block Phillips's father's name was Uri Shraga, it appears that Hyam Bloch (or Block) changed his surname to Phillips upon arriving in England, based on the common anglification of his father's first name. The reason for the name change may have been connected with Hyam Phillips's reputed activities in the Polish revolt. He may have been sought by the Russian authorities and concealed his identity upon arriving in England. The identity of Hyam Phillips' father can be established within the immediate family of the Gaon of Vilna. The Gaon had a son-in-law Rabbi Uri-Shraga-Feibush, son of Shlomo, of Dubrovno, Byelorussia. The triple-barrelled name consisted of the Hebrew Uri with the Yiddish/German Shraga-Feibush and was often shortened by dropping one or other of the names. Rabbi Uri-Shraga-Feibush was married to the Gaon's daughter Tauba. Tauba was Uri-Shraga-Feibush's first wife and several other marriages by Uri-Shraga-Feibush are recorded. The multiple marriages of Uri-Shraga- Feibush complicate the establishment of Hyam Phillips amongst his progeny with respect to the other two wives. Yet, since the tombstone states that Hyam was a grandson of the Gaon, his mother must have been Uri-Shraga-Feibush's first wife Tauba, the Gaon's daughter. at best include her name with no biographic details. Similarly, little concrete biographic material exists regarding Tauba's husband Rabbi Uri-Shraga-Feibish of Dubrovno. His claim to fame seems to have been his status as a son-in-law of the Gaon, and the fact that he helped publish the Gaon's writings after the Gaon's death, together with the Gaon's sons Yehudah-Leib and Avraham, and another of the Gaon's sons-in-law, Moshe of Pinsk. In addition to his efforts with the Gaon's writings, Rabbi Uri-Shraga-Feibish wrote a book in his own right called "Menorat Shlomo", dedicated to the memory of his father, Shlomo. have been sought in several books written by relatives of his second and third wives which refer to him , such that the relevant time span can be narrowed down . In addition to the discovery by this author of the existence of Tauba's son Hyam Phillips, there is oral information about a certain son of Tauba and Uri-Shraga-Feibish who settled in Safed, Eretz Yisrael about 1836. Most of his family perished in one of the frequent earthquakes of the period, and his descendants returned to Europe, settling in what is now Hungary/Roumania. His family claims that the name of this son of Tauba and Uri-Shraga-Feibush was Eliyahu Reezel. The Reezel family maintains that Eliyahu's mother was Tauba, daughter of the Gaon. Details of this family and others, coupled with Hyam Phillips' birthdate, led this author to conclude that Tauba was one of the Gaon's youngest progeny. This had to be so if she was still of childbearing age at the time of Hyam Phillips' birth in about 1812. Hyam must have been Tauba's youngest child because her birthdate cannot be stretched later than about 1768, bearing in mind Tauba's mother's age and childbearing ability. Hyam Phillips's birthdate varies in the available sources. His tombstone states ‏"sixty"‏ both in Hebrew and English, establishing a birthdate 0f 1817. His marriage certificate in 1851 states his age as 31, which sets his birthdate at 1820, and not 1817. The death certificate, however states his age as 65 which would make his birthdate 1812.
time of, or very shortly after, Hyam Block Phillips' birth. In fact one of the books which was written by Uri-Shraga-Feibush second wife's grandfather was published in 1817 ("Nakhalat Azriel") . Since Uri-Shraga-Feibush and his second wife are both mentioned in the introduction to the book, the first wife, Tauba, must have already died by the time the book was published in 1817. Therefore, it can be concluded that Tauba's last child, Hyam Block Phillips, was born before 1817. It seems that the surnames Bloch and Rokeakh may have been used interchangeably by families in Lithuania bearing these names. Rabbi Levi ben David Rokeach (died 1818 in Vilna) married a daughter of Noakh Bloch (died 1809 in Vilna) . Some of their descendants used the surname Bloch and others used Rokeach. Support for the contention that these two familes may have been the same family is found in a death notice that appeared in the Hebrew newspaper Hamaggid in 1874 for Moshe-Leib Bloch Rokeach! Further supporting evidence for a Bloch-Rokeach connection is the fact that the father of the abovementioned Noach Bloch of Vilna was named Shraga-Feibush. This name passed down through both the Bloch and Rokeakh families and presumably shared its origins with the father of Hyam Phillips, alias Khaim Naftali ben Uri Shraga (Feibush) Bloch. This author has tried to trace the ancestry of Rabbi Uri-Shraga-Feibush of Dubrovno to establish a Bloch connection, to no avail. Jews in the Russian Empire were not required by law to use surnames until 1804, so for most of his life Uri-Shraga-Feibush would have had no official surname, if in fact he ever adopted one. Therefore it seems that his sons took different surnames, some chosing Bloch, others Rokeakh and one Reezel. One Bloch family claims descent from the Gaon via the families Shmukler and Boyarsky . One member of the family, Rabbi Avraham David Bloch (died in 1943 in Vilna) wrote several books including "Divrei Eliyahu". Whilst Bloch's wife was reputed to be descended from the Gaon, Bloch does not mention any relationship with the Gaon in his book. This is surprising since Bloch spent most of his life studying in the ‏Kloiz of the Gaon‏ in Vilna. His wife, Khaya Feiga was the daughter of Rabbi Eliyahu Shmukler of Ivia. A biographic note about Shmukler in "Sefer Zikaron Lekehilat Ivia" (the memorial book of the community of Ivia, Lithuania) states that Shmukler was of non-rabbinic descent. So if Shmukler's descendants were connected with the Gaon it would have had to be through Shmukler's wife, Tzeite Miriam Boyarsky. This author's study of the Boyarsky family does not confirm this. Rabbi Alexander Margolis of Satanov. Rabbi Avraham ABD Lazdei who was the Mekhutan of the Gaon of Vilna. Whilst the connection between Bloch and Margolis is known , the relationship with Avraham of Lazdei (later of Serhei) remains a mystery, yet another tangled Bloch connection.